A bee sting reaction is a very serious, sometimes fatal condition that may need immediate professional treatment, depending on the severity. Whether it comes from a bumblebee, honey bee, hornet, sweat bee, horsefly, wasp or yellow jacket, a bee sting is a very painful and often unexpected bite. The venom and toxins injected into the skin during the sting occurrence differentiate, so it should never be assumed that a sting will not produce severe, even fatal side effects. If you've been stung by a bee, you'll immediately feel the painful sting and often find the remaining stinger in the surface of the skin. It's crucial to remove the stinger as soon as possible, to avoid further injection of the venom into the bloodstream. Localized symptoms are present in a bee sting regardless of the severity of the reaction. Swelling: Swelling will begin immediately at the wound site. A raised, reddening welt is the most common bee sting symptom. Itching: Itching will occur almost immediately at the wound. Itching may subside after several days, but can last up to a week. Vomiting: Vomiting may begin immediately after the sting or begin shortly thereafter. Nausea: Nausea or dizziness indicate a systematic reaction. Diarrhea: Diarrhea indicates a systematic reaction that requires further care. About two percent of bee sting victims may experience what is known as an anaphylactic reaction. Within two minutes of a bee sting, the victim may experience wheezing, drop in blood pressure and difficulty breathing. Without immediate care, this condition can be fatal. Close to 50 people die each year in the United States due to an anaphylactic reaction. Anyone can be allergic to a bee sting, no matter their age or previous allergies to the insect. This is why it is so crucial to treat any abnormal reactions with immediate care. Obviously, those that are experiencing the extreme case of anaphylactic symptoms require emergency care. Victims experiencing systematic reactions should seek timely treatment and keep a close eye on further symptoms. 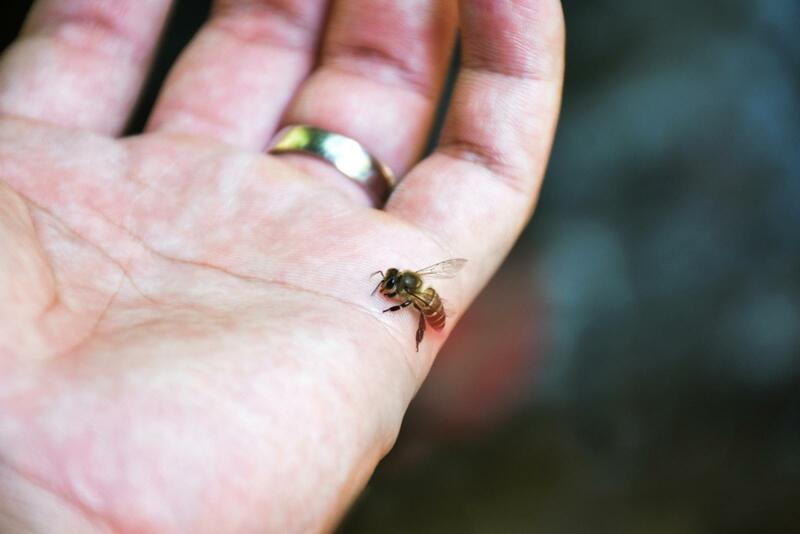 Regardless of the severity, a bee sting is a painful and dreaded bite. In effort to avoid their stings, refrain from wearing bright colored clothing and applying fragrant body products or perfumes prior to venturing outdoors.